15 November 2013, Tate Modern, London. Mia Ridge (Chair) welcomed everyone to the meeting and thanked the people who had arranged the event for all the work they had put in to make the meeting happen. This was largely a year of consolidating changes that had been discussed for some time, but we also experimented with new event formats and held our first event in Northern Ireland for some decades. We reviewed the current membership models in a small working group then took our proposal back to the wider committee for approval. The constitutional changes proposed are designed to help us have a more effective voice at senior levels within museums, funding bodies and other cultural agencies by creating an ‘Advisory Board’. Other changes include updating the language around events and membership models, clarifying the pricing structure for Corporate Memberships in relation to UKMW ticket prices. We also reviewed the election procedures and committee structure, aiming to ensure a more even distribution of tasks across the committee. During the year we also updated the email list guidelines to help members understand what’s considered a commercial post. The final accounts of the Museums Computer Group as at 31 December 2012 are submitted for the Meeting’s approval. They were produced by Robert Mathie, Management Accountant at National Museums Scotland. The accounts show a balance of £8,098 at the year end – up from £2,266 in 2011. The major outgoings of the year were the UK Museums on the Web 2012 conference held at the Wellcome Collection, and the Spring Meeting organised with DLNet at the University of Manchester. The Income and Expenditure account shows that in 2012 the Museums Computer Group had an income of £13,014, an expenditure of £7,183, and a surplus of £5,831. The Balance Sheet shows that at the end of 2012 the Museums Computer Group had assets totalling £8098. In the last year the Secretary has made a number of improvements to the way MCG memberships are handled. Corporate memberships are now processed by the online form in addition to individual memberships. All membership requests go to the Secretary email account, with corporate memberships being automatically forwarded to the Treasurer account for invoicing. The format of membership notifications to the Secretary has been updated to ease the process of adding these to memberships spreadsheet, and new memberships are also now automatically added to ‘Contact Form DB’ MCG blog database. The draft version 2 MCG constitution was revisited by Adrian Stevenson and Mia Ridge. This was then updated for approval at UKMW13 by Mia Ridge and others. MCG has 193 individual members and 4 corporate members who have registered in the last 12 months from UMMW12 to UKMW13. MCG continues to represent the breadth of the museums and wider cultural heritage sector well, having 130 different organisations signed up. The highest number of individual members we have from any one organisation is four (IWM, NLW, NT, Southbank Centre and Univ Leicester). Most organisations have just one member of MCG. Our membership includes 37 Museums and 4 galleries, 17 universities, 7 councils. In addition we have Trusts, design agencies, development companies, consultants, and other heritage organisations. 29 Officers – web, research, development, digital, documentation, marketing, information, museum, collections, learning. 23 people with ‘digital’ in their job title, the most popular ones being Digital Media Manager, Digital Officer, Digital Project Manager. Only 12 people with Web in job title – content people, developers, managers, officers, editors. 14 students – including PhD students. 8 researchers of various sorts. In addition we have some curators, members of project teams of various sorts, some IT, database and systems people. I’m standing down from the committee this year. I’ve had a great time in the last two years, and I’ve got to know some great people. I’m sure the new members will have a great time. The Belfast event (see also Engaging Visitors Through Play), hosted by the Centre for Media Research on May 30 at the University of Ulster, Belfast Campus had c65 attendees from a range of museums/ funders including: Ulster Museum, Irish Museum of Modern Art, National Gallery of Ireland, Northern Ireland Museums Council, National Museums Northern Ireland, The Hunt Museum. We experimented with a game designed to get people talking, thanks to Alex Moseley. The event lead to the creation of a Facebook group that has 200 members, and around 50 views a day. The MCG event made those that attended see that it is possible to side step traditional training and networks and create your own more relevant network / events. The pre-conference #drinkingaboutmuseums was the first social museum meet up held in Northern Ireland, but there have been a few similar meet ups held since. In all the event seems to have created a shift, and a more can do attitude among early career museum professionals. Rather than being told what they can do, what they should learn, what they can attend. They have banded together to form their own Community of Practice, which simply didn’t exist before that event. One great event that was developed was a two day trip to Dublin that was organised through the Facebook group. It was free to attend and about 20 people went to it, it involved exhibition tours, workshops and a #Drinkingaboutmuseums. The event also helped foster links between museum professionals, with many of those that attended now using Twitter to talk to museum professionals from the big ‘institutions’ which perhaps before they wouldn’t have had the confidence to do. We worked with the Collections Trust to organise a ‘museum informatics’ event held on 4 June 2013 at the National Railway Museum, York. This was a one-day event for museum informatics, IT, knowledge and information specialists in museums and heritage. We developed the agenda for the event collaboratively with the Collections Trust in response to MCG list discussions about new directions and priorities in collections information management. 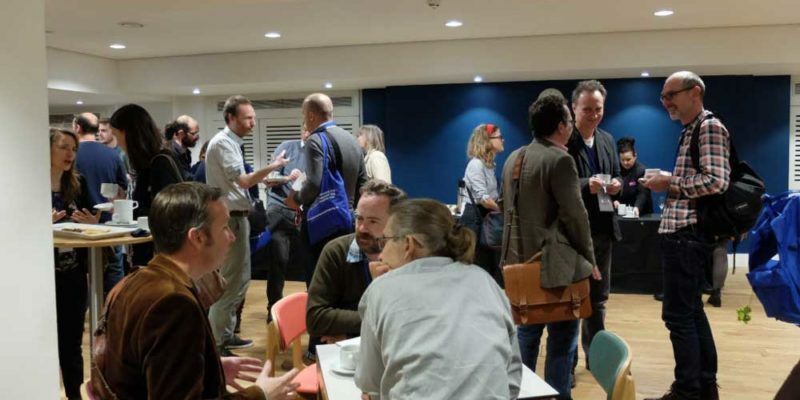 We also used our usual pre-event meetup on 3 June 2013 to experiment with a new format – a ‘Failure Swapshop’, a ‘light-hearted way for us to learn from each other and where the emphasis is not on the failure itself, but on what happened next’. Many thanks to Joe Cutting for kicking off an evening of conversation with a great example, and even a physical prop! We reviewed the impact of last year’s efforts around speaker diversity (academic, practitioner, agency; gender; region; established and new voices; large/small/no organisation, etc), and tweaked the Call for Papers and communications around them and included notes on balancing diversity in instructions to the UKMW13 programme committee. This seems to be successful as we had a lot of excellent submissions. There is a new look and feel to the MCG website and thanked Andrew Lewis, Dafydd James and Danny Birchall. The website improvements were based on survey feedback. It now includes a feed from the mail list and the twitter feed. It’s also now fully responsive and mobile compatible. It was noted that the twitter following had doubled in the last year and that the JISCMail discussion list continues to be very popular having 1238 members. Carolyn Royston’s (Professional Development) noted that there wasn’t a huge amount to report but there’s lots of potential in the PD area. Carolyn had recently met with the Museum Computer Network (MCN). This network is trying to run an online development programme. MCG could get involved with this initiative. Carolyn suggested that MCG could help the Museums Association with digital education, and suggested conversations with them. The MA had very little digital content throughout the annual MA conference that was held the week before. Carolyn is also working with the AMA. The organisation Culture Hive would like toolkits from MCG and CR suggested that mailing lists could be cross-pollinated. Carolyn highlighted that there opportunities do exist but we need to work together. Mia Ridge introduced the constitutional change document. A link to the document is here: Proposed Constitutional changes. Mia Ridge thanked previous Secretary John Williams for his hard work in putting together the previous constitutional drafts. The main change to the constitution was the addition/development of an advisory board. The Committee now need to work out how to implement the Advisory Board and recruit members. The new constitution reflects how MCG undertake elections. Mia observed that it had been MCG’s recent practice to accept all nominations and agree roles at the first committee meeting rather than hold secret ballots as per the constitution. Specific information on membership fees has been taken out of the constitution because this varies each year based on the conference price. MR noted that the state of the sector has affected the MCG in terms of committee members now having more pressure in their daily work so less time and energy for MCG duties. The constitutional changes were proposed and accepted. There was a call for questions from the floor. No questions were raised. There was no nomination for secretary. There were two nominations for membership. Mia Ridge noted that there were two nominations for two vacancies, so an election was not necessary and nominations from the floor would not be called for. The meeting agreed to follow this recommendation and all candidates were unanimously elected to the committee. MR thanked Johanna Pérez Strand and Julie Reynolds and welcomed them on board. Mia thanked the leaving members and presented gifts. Posted in AGM by mia on November 15th, 2013.